We have arrived in the port of Savu Savu, on the island of Vanua Levu, Fiji. It was a trip of extremes, starting a little unplanned when we escaped from the anchorage at Ha'afeva late Wednesday evening. By Thursday morning we were motoring in a glassy flat calm which remained for nearly 24 hours. Then the winds and seas arrived -- 25-35kts out of the southeast, with 7-10' seas -- and stayed with us the 48 hours until our arrival here. We're now here in Savu Savu, we've picked up a mooring, hosted the Health, Customs, Immigration and Quarantine officials, and poured out a couple of glasses of wine! Happy to be stationary! After 11 nights in Vava'u and 6 in Ha'apai, we are on our way to Fiji. On Tuesday we came to Ha'afeva - one of the more western islands in the Ha'apai Group - as a preliminary to leaving. 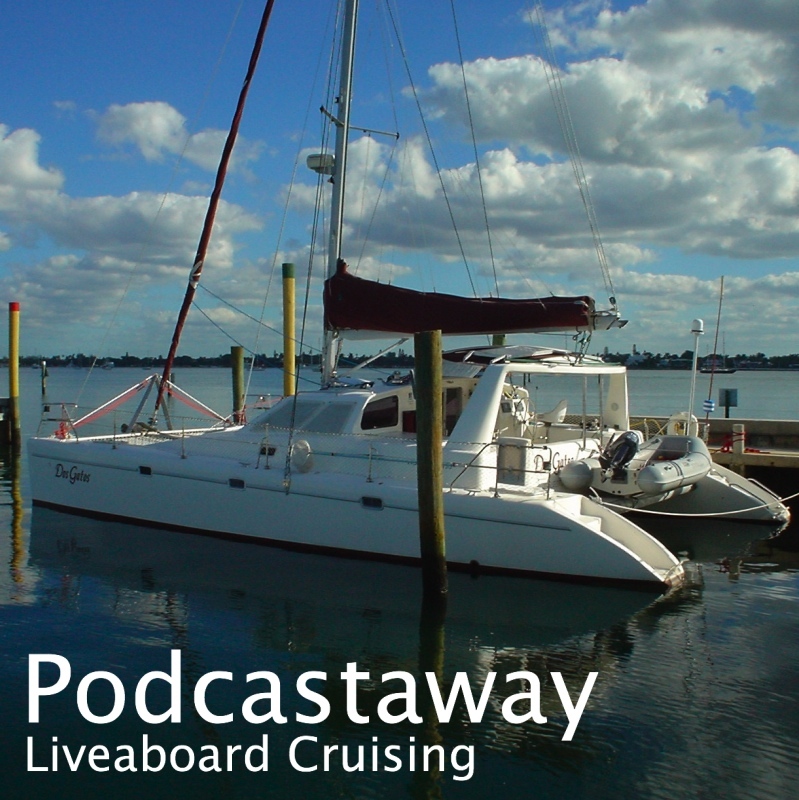 We had not decided whether to leave Tuesday - if the anchorage at Ha'afeva was not good - or Wednesday or Thursday. We'd had a day or two of northerly winds and the anchorage we first visited on Monday turned out to be insufficiently protected. We arrived at Ha'afeva in rain and thunderstorms. The western anchorage at Ha'afeva was receiving the northerly swell so we moved to the east side which is better protected to the north by the reef, but less well protected overall. We spent Tuesday night there and went diving off the reef Wednesday morning. The wind was northwest. Wednesday afternoon the wind switched to the south and it started to rain. About an hour later - at around 5pm - the wind and rain suddenly grew in intensity. I went outside to look and found the dinghy trying to get underneath the bridge deck -- we were dragging backwards towards the reef. I started the engines and Ginger switched on the navigation equipment and closed all the ports. By then the wind was over 30 knots and it blew over 30 (with gusts to 45) for the next two hours! We had dragged north and were now over part of the reef. I was getting some occasional depth readings showing less than a foot under the boat. The sea had built to a 4 foot chop. We waited for the 'squall' to pass but it never did. Eventually, as it was getting dark we decided to try getting the anchor up to get out of there. We had no idea how tangled it was in the coral, but happily it came up and we carefully left the anchorage. Rather than re-anchor we decided to get offshore and head for Fiji immediately. The conditions are now calm. We stopped a few hours ago and I dived to inspect the hull. There were some chain scrapes and a few other marks that suggested a brush with coral but no significant damage. After we left I got more weather data - I had looked at the weather sources earlier on Wednesday to decide when we should leave - the new downloads showed a frontal system just east of Tonga heading east at 10 knots that was not on the previous download. So it was a frontal passage not a squall. It was sudden fast-moving and intense but over relatively quickly. That was an experience we do not want to repeat. Goodbye, Tonga. PS The photo above is Tofua - scene of the Mutiny on The Bounty - as we passed. 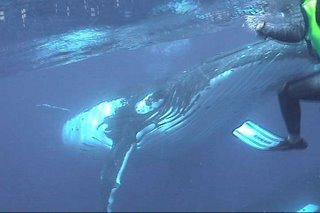 Watching the Humpback Whales is a big attraction in Tonga. Daily, maybe 6-8 boats are out taking tourists to the whales. Tonga is one of the few places where they still permit tourists to get in the water and snorkel with the whales - under the strict supervision of a guide. Each winter, the whales come to Tonga to mate and give birth in the shallow tropical waters. Then they migrate back to Antarctica to feed over the summer. They are in Tonga from June to October. We went out twice. The first time - with 'Whales in the Wild' was unsuccessful. We saw whales but did not get into the water. The whales have to stop and stay around to be interacted with. If they keep going you can't get near them. We decided to have another go (at over $100 each!) and went out with Dive Vava'u. We snorkeled and saw whales four times, but the final snorkel was a LIFETIME EXPERIENCE! Two whales were asleep 50' down as we snorkeled above them. (Yes, whales sleep underwater 10-15 minutes at a time.) Then the whales awoke and slowly surfaced by us. They came over to look, maybe 10 feet away, and then turned and came back again. This went on for several minutes. I had my underwater video running continuously and got some great shots. It was simple awesome! The photo above is a frame from the video. I have just posted a short Podcast recorded over two overnight hops from Samoa to Vava'u. It may be downloaded from my Podcast page. We finally got out of Niuatoputapu. We left Saturday 8 am and got into Neiafu midday Sunday. It was a bumpy ride, with 6-7' seas on the beam. Vava'u is a more yachtie oriented place. Having a Mornings base here helps. 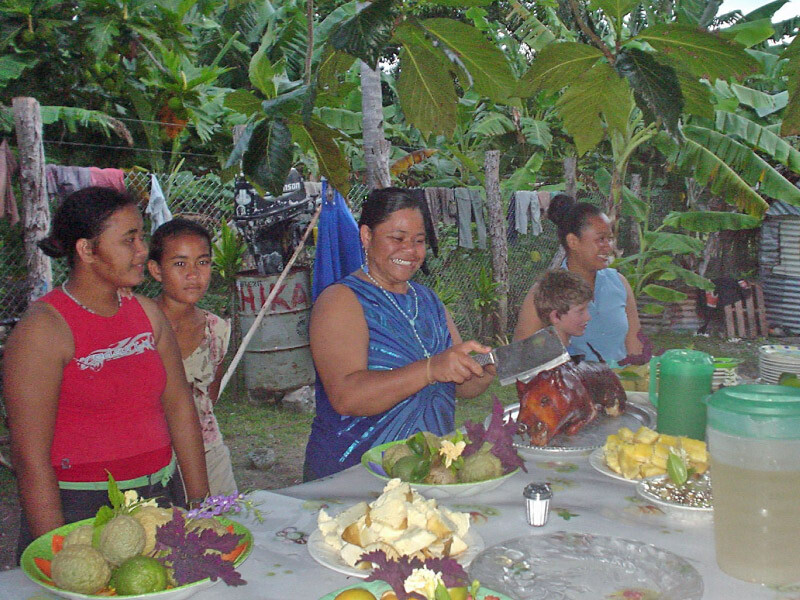 We plan to stay in the Vava'u group about a week before we move on south to more of Tonga. While here, we plan to go whale watching (we saw loads on the way in but want to get up close). 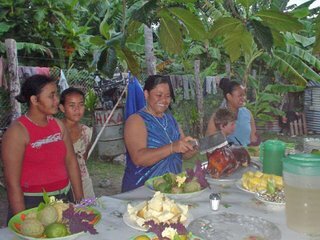 We also have a Tongan Feast on the agenda. And as much diving as we can fit in, of course. Nearly two weeks in Niuatoputapu and the wind is howling. There have been quiet days, and days when it rained buckets, but the seas south of here have been just too big to go that way. It looks like the winds will ease tomorrow (Thursday) and maybe we'll leave Friday. This isn't a bad island to be stuck at. Although there are no stores, restaurants or other facilities, there is good diving and the locals are friendly. We've made six dives so far just outside the reef. There's a convenient dinghy passage across the reef that we've used for most dives and the area it accesses is sheltered and interesting. The reef there is in huge blocks and walls that reach from the sandy bottom at 40 feet up to around 15 feet. We have made one night dive but it was challenging to find the dinghy passage to come back in the dark - although we had a GPS and had left a marker float in the channel. A local family - Seea and Niko - do a lot with the cruisers. A week ago they held a pig roast for us - two piglets actually - and they also held a fish lunch on Sunday. There's a rumor they may hold another pig roast before we leave - they do so when there are enough boats in the anchorage; today there are eight.